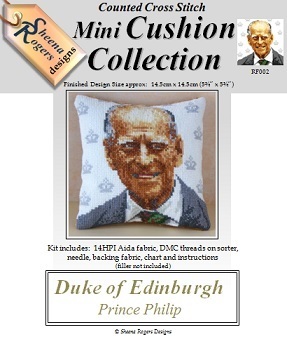 Cross stitch a portrait of the Duke of Edinburgh, Prince Philip with this mini cushion kit which makes a lovely companion to the Queen Elizabeth II design. The mini cushion cross stitch kit includes: 14HPI white Aida fabric, DMC stranded cotton threads ready-sorted on a card sorter (which includes symbols beside each colour number), needle, gold-coloured velvety backing fabric, b&w symbol chart and full instructions (cushion filler not included). Only whole cross stitch is required throughout with backstitch detail under the eyes and the design size is 5¾" (14.5cm) square.